As I noted in a previous blog (Surgery For Gynecomastia (Enlarged Male Breasts) Has Become Very Popular and Satisfying), surgery for gynecomastia (enlarged male breasts) continues to increase in popularity. 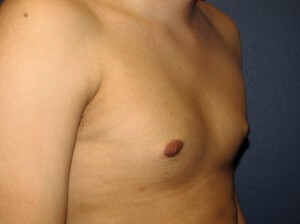 This is a consequence of several factors: a greater awareness of the issue, the desire to have more sculpted, masculine breasts; feelings of insecurity, inferiority and self-consciousness of having feminine appearing breasts; and the knowledge that there are very effective and safe treatments for this condition. Men from all over the Valley – Scottsdale, Phoenix, Glendale, Mesa, Tempe, Chandler, and Gilbert as well as elsewhere – are seeking surgical treatment for their enlarged male breasts. Treatment of gynecomastia usually consists of ultrasonic assisted liposuction (UAL) with or without direct excision of breast tissue. In rare cases of focal gynecomastia, commonly found in body builders who are using or have used anabolic steroids in the past, only direct excision of breast tissue is needed in order to obtain the desired result. 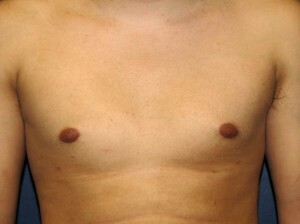 The following patient of mine illustrates a typical case of enlarged male breasts. 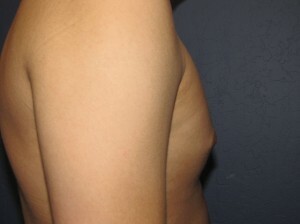 This is a 22 year old male with gynecomastia that has persisted since puberty (photos A, C and E). He is so self-conscious about this that he will not even remove his shirt in public. There is no history of steroid, marijuana or any signficant alcohol use. Treatment consisted of ultrasonic assisted liposuction (UAL) without any need for direct removal of breast tissue. A total of 325cc of fat was liposuctioned from both breasts using small incisions placed along the lateral aspect of the lower breast fold (photos B, D and F). The ultimate outcome was exactly what the patient had desired. For more information on male breast reduction surgery for the treatment of gynecomastia or for any other plastic surgery procedure that I perform or to schedule a complimentary consultation with me, please contact my office at 480-451-3000.